For those of you young-er folks who have grown up with computers and the internet and consider all that technology and online media to be normal, you don’t know how really dull and boring things were before home computing came along. My biggest technological thrill when I was growing up back in the early 70’s was owning a short-wave radio. I was like 8 years old and I remember tuning in some Eastern European radio station that seem to play nothing but a station identifier composed of a short sound bit of an orchestra playing a few notes. It was a real magical experience. It drifted in, then out, and just when you turned up the volume to hear it better it came blasting back again, bouncing off the ionosphere or something. Nowadays we can watch webcams from the other side of the world. Another big thrill for me was taking electronics apart and just seeing what happened when I shorted out parts of the circuit boards. Things would click, lights would go on or off, and once in a while some smoke would appear. As long as the thing was only powered by batteries it was perfectly safe, I guessed. I owned a cassette tape recorder the size of two bricks, the kind with big white piano-like keys to control it. I got a real technology thrill from recording friends and family members and playing it back to them. They got a thrill from that too. An even bigger thrill came when I discovered that if I touched parts of the solder covered side of the circuit board with my bare fingers when a blank cassette was in play mode, various musical squeaks would jump out of the speaker. I’ve always wondered if silence and emptyness was actually more inspiring for creativity than the constant chatter of “important artists” and one’s “helpful friends”. It’s true that artists will sometime get ideas and inspiration from the work of others but too much inspiration from the work of others leads to nothing more than imitation and rigid, inbred “styles”. 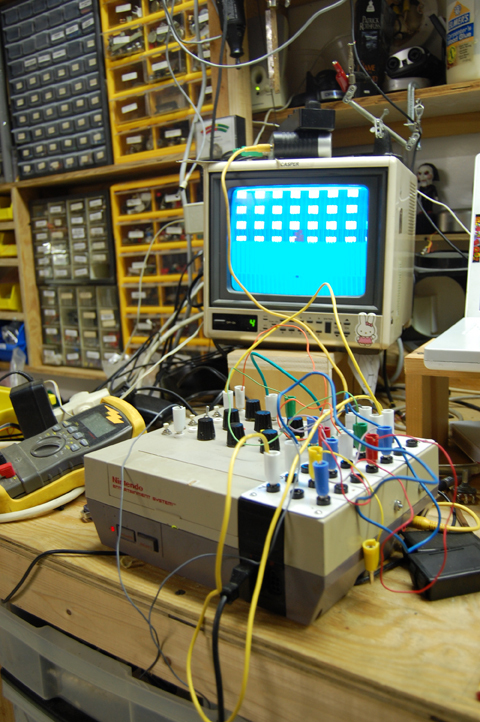 And now back to the creative abuse of technology: Pete Edwards of Casper Electronics (“the friendly ghost in the machine”) had been doing some very advanced tinkering with common electronic equipment. His own words and his two YouTube videos here say it all. It’s something to think about when we leave this little bit of West Texas and head back to the New York City of Fractal Art. I’m not talking about where you live but where your mind is. The online Fractal Art world is mostly a little social club devoted to self-congratulation, as I think Terry’s recent series commenting on the folks over at Deviant Art has shown. If you’re already in West Texas then I’d suggest you stay there; you’re not missing a thing. Image by Pete Edwards at Casper Electronics. This is a modified Nintendo video game console. It is a very simple bend and is a lot of fun to play with. To bend this unit I simply added a patch bay to a handful of points on the video processing chips. The Display can be tweaked by either connecting points together or by feeding in external signals, like audio or voltages from my modular synthesizer. the video shown above is an example of how the visuals can be controlled using clock signals from my modular synth. Here’s another of Pete Edwards giving a live performance. It’s not too visual (because it’s rather dark) but the music, or sound sculpture, is interesting. That said, yes, I appreciate the creativity in Pete Edwards’ work. The final results don’t do much for me, personally, I’ve never been too interested in electronics despite some of my close friends’ obsession about it, but I can see the passion behind his works and it’s inspiring. As for the creativity and stimulation & feedback relationship, I must admit that I find it hard to keep my art personal and to block out mainstream influences once I post them in public websites (yes, I use deviantArt for the most part). However the website and the people in it are also what pushed me to keep working with fractals -probably for the wrong reasons- and now I can look back and change my reasons for being involved in fractal art. On an unrelated note, I would appreciate a response to my e-mail. It is GREAT being a Texan !!! !